Vertical glazing or peak glazing: We can restore regardless of the size – on request with the inclusion of ventilation or RWA louvers. Roof structures made of wire-reinforced glass, commonly found in railway stations and industrial buildings, are in need of repair due to years of environmental and weathering conditions. 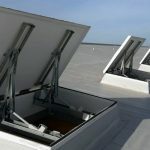 New requirements for thermal insulation which promote energy savings, and the subsequent installation of smoke dampers, require remedial measures. We have the necessary knowledge and years of practical experience to assist in this area. We also pay full attention to economic efficiency in renovation: We ensure the inclusion of existing substructures and full operational use of the building during renovation. BÖRNER’s renovation products provide important building blocks for the stability of skylight structures. We replace wire glass panels with new web plates which deliver a higher U value. Costs can often be reduced through reuse of existing substructures. New clamp and seal parts, ridges and eave flashings provide a structure for renovation support and stability. Landmarked buildings often pose high requirements for roof reconstruction. We replace wire glass panes with tongue and groove systems. We can integrate any desired louver size into saw tooth roofs.